This session presented research-based findings and trends on compensation practices, executive compensation, business alignment and much more to create compelling value propositions for the multi-generational workforce. Only two in five employees believe their company has a compelling and differentiated value proposition! Changing Demographics: How can we ensure pour proposition resonates with the five generations? Workplace for me: How can we meet individuals evolving health, wealth and career needs? Flexible Working: How do we create a culture that enables people to contribute under flexible work arrangements? The focus of the year 2019 would require APAC leaders to translate their organization’s EVP into an IVP- Individual Value Proposition. Now, before you gather your Talent Acquisition and Communication team to revisit the value proposition for your existing and potential employees, take a pause. Maybe this time you would want your Compensation & Benefits and Rewards team to take charge and translate your EVP into IVP! 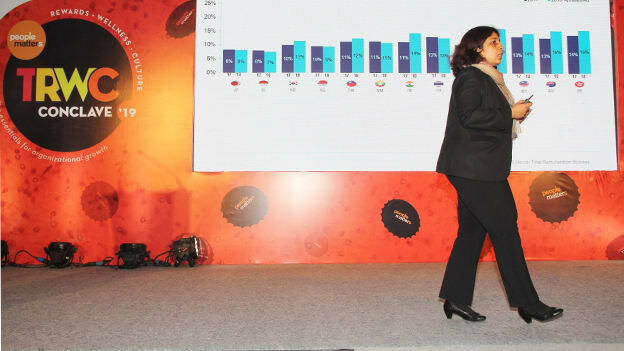 Namita Bharadwaj, Principal- Talent Management Advisory, Total Rewards Advisory, Mercer Consulting during one of the sessions at People Matters Total Rewards and Wellness Conclave-2019, the top Compensation & Benefits priorities for APAC leaders. According to a report by Mercer, thriving employees are 3x times more time likely to work for a company with a strong sense of purpose. However, only 6 percent of companies’ EVP differentiated by a purpose-driven mission. According to Mercer 2018 Global Talent Trends Report, employees in Asia said that “Compensation” positively impact me at work. Compensation is not only restricted to fixed pay but a lot about the perception and the fairness of the compensation offered. More than half of the respondents shared that their health and well-being is important and prefer companies to offer them. It has to be around- Physical, Mental and Financial Wellness. Many traditional corporate wellness programs only recognize the physical component of health. While this approach is better than nothing, employers that only emphasize physical health are missing out on a significant opportunity to positively impact their organization. While this is one of the most cliché questions in an interview but now employers need to ask themselves on how they can help employees to accelerate their own career. Provide avenues- to your new employees and communicate to your potential employees how they can progress to the learning, levels, roles, and compensation in your firm. Allow them to steer their own career rather forcing activities on them. Companies need to recognize that being financially stable is an acute need for their workers. The thought of an employer getting involved with workers’ financial concerns would be an HR or People team’s outlandish, but employees are increasingly turning to their place of work for help and guidance. So, companies should think about ways they can support employees in this area. Employees want more flexibility and mobility and want alternate ways to operate and work. From increased productivity to fewer missed days and significant savings to a more loyal workforce, not only employees but employers benefit greatly from adopting flexible schedules in the workplace. The report highlighted that 66 percent of employees in Asia shared that with introduction of flexible benefits, we were managed on results and not hours. However, 41 percent of employees are still concerned that flexibility will impact their promotional prospects. The session was concluded by Namita that, “Organizations need to bring it together to create a compelling experience based on unique needs and desires.” It provides multiple dynamic lenses to evaluate programs, builds relevance into all programs to target investments, and foundation for a personalized experience.